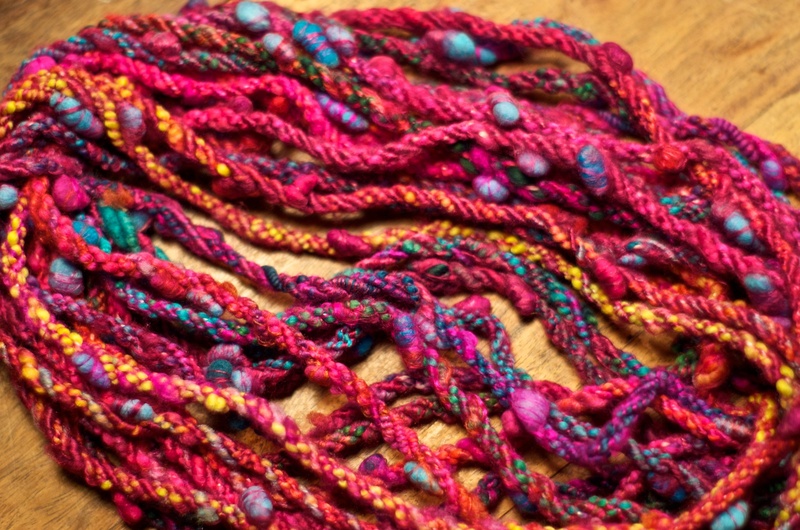 Home » Art Yarn » What is ‘Art’ about ‘Art Yarn’? What makes a yarn creation ‘art’ rather than ‘craft’? Is craft art? Is art crafted? I could go in circles over this for quite a while! But it IS something I have put a lot of thought into over recent years, and it stems partly from the age old debate about ‘what is art’. 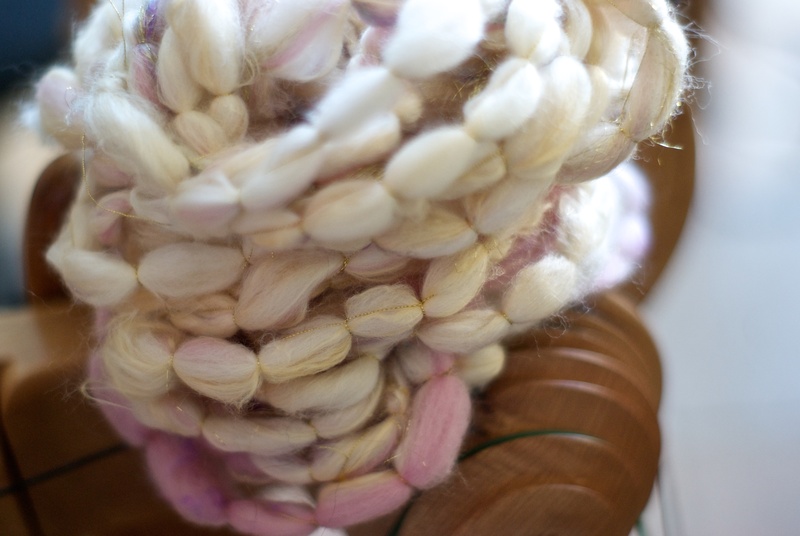 Traditionally, spinners have been considered craftspeople, we have learned skills, techniques, and knowledge that has been gathered over years and honed into something we can turn into beautifully crafted yarns. Often what we craft as spinners is the key ingredient in something that IS made as ‘art’ – tapestries, weavings, art installations.. However, to my thinking, there is also a time when we can call our handspun yarns ‘art’, I think there is a threshold we cross that moves what we spin from being a ‘craft’ product right into the realm of being ‘art’ in and of itself. I think it needs a few specific elements to take it beyond the skilful activity of crafting and into the expressive activity of making art. And it is of course as always, in the eye of the beholder, or rather for us, in the intention with which we create. I have an idea about the specific elements I believe ‘art yarn’ needs to have in order to be called art (and remember I view this as being is different from ‘textured’ yarns,’themed’ yarns, ‘intuitive yarns’ or even ‘no rules’ yarns). What follows is an overview of the approach I have worked on developing and solidifying over some years of spinning, from teaching art yarn workshops around the world, and as a result of my experience in co-creating and running the Journey to the Golden Fleece Creativity course (plus others) for Fiber artists at Fiberygoodness.com. I want to share this approach because inside it I have found some specific methods for taking abstract ideas, feelings, and notions and turning them into concrete, tangible expressions = art. 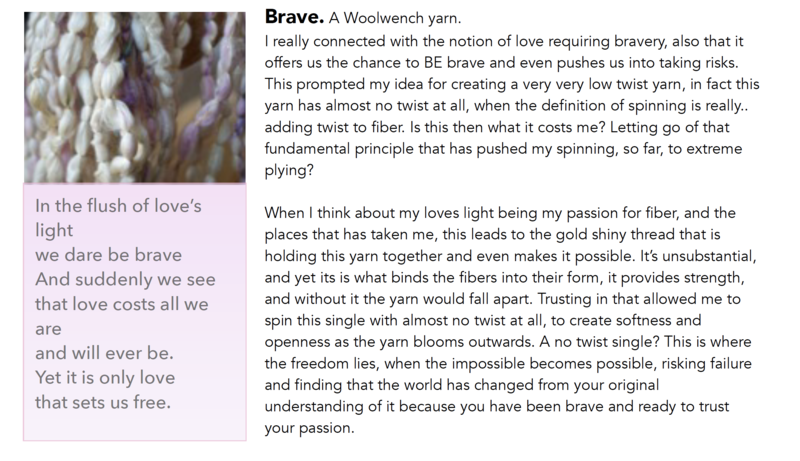 I hope this is a useful approach for anyone wondering how to take their spinning beyond the craft and into something that reflects who they are and what is important to them, beyond making something wonderful to knit with and into making something that is unique, distinctively ‘you’, and that expresses something important to you. This is a threefold approach that includes concept (inspiration), design (construction), and technique (execution). The yarn you are spinning is not just for the sake of spinning, for this yarn you are wanting to express an idea, a theme, or a concept in your yarn. This is where you make choices in terms of fibre selection and techniques in relation to the design that you are aiming for. How do you turn the idea of ‘wild’ into something you can spin? How do you turn the abstract idea you have into a concrete construction? Each element of your design reflects your own interpretation of your idea and theme. This includes your colour choices, your fibre choices, and the ways you have chosen to spin, your techniques. Each element of your design is an expression of your idea. It is planned and imagined before you even get your hands and fibre to the wheel! I have found the activity of mind mapping to be an immensely useful way to design art yarns, I have adapted this for art yarn design to keep me focussed on the concept or idea being contained in the yarn, and making sure each individual design decision relates directly to the concept without becoming diluted with side-tracks or irrelevant additions. It is also a wonderful tool for helping me move from ‘abstract’ to ‘concrete’, from idea to something I can hold and spin. I include instructions for this in most of the art yarn courses we offer at Fiberygoodness. This art yarn is your chance to show your mastery of your techniques and your control of the process, the amount of twist you add, the ways you have plied, the additions you have used to add to the design. You are literally constructing your art yarn by layering your design ideas, techniques, and materials into one cohesive piece. Artistic Expression and the importance of practice. Your art yarn is an expression of yourself, it is created from the harmony between you, your fibres, and your tools. Think of yourself as an artist! A musician! Your first task on the way to becoming a virtuoso is to practice, a LOT. The goal is to become very familiar with the notes – the fibres, colours, add ins, and to master your instrument, your tools and spinning equipment, as well as the music you will play (your techniques). This knowledge and mastery means that you become one with your wheel and your materials, you will instinctively KNOW how you can create the fibre music that is in your head, which fibres to choose, which techniques you need to express those ideas, and how you need to construct your yarn to get the results you want. This is a kind of unconscious mastery that comes from much practice! Each yarn you spin becomes your starting place from which to continue on your practicing and experimenting. Your first task is to build up your stable of techniques to draw from later when you are planning your designs. Concentrate on learning as many spinning techniques as you can, really get confident with each one, so you can then branch out and start making your own variations on them, change around your fibre preps, try non traditional textures in traditional yarns, add in autowraps, locks, play around with every aspect of each technique and you will soon develop a deep knowledge of how that yarn works and how far you can take it! You need a knowledge and understanding of different fibres and what they can do for you, and of different fibre preparations and how you can spin them. The basic techniques you need are: corespinning, lockspinning, auto wrapping, bulky. You also should know how to spiral ply with a thread, coil ply, and Navajo Ply. Once you have mastered these techniques you can start to PLAY with them, alter them, experiment with different fibres, add to them, try variations on them. This is part of building your stable of techniques! When you come to making your deliberate art yarn designs you will have the confidence and skills you need to focus on the theme and idea you wish to express, rather than struggle with technique. With practice this is inevitable! You WILL reach this point and then you will have the freedom in your spinning and art yarn practice to really create art in your yarn! Then when you apply the three principles of: Concept, Design, and Technique to your spinning, you will find you are creating unique, expressive, and exciting yarns that you feel are a good representation of your artistic self. As an example of ‘art yarns made using this approach I would like to share with you one of my art yarn designs, included in one of our Fiberygoodness ‘Yarn Recipe’ sets. This one was a set that Arlene and I both designed for, and was based on the words of Maya Angelou. Of my own designs the one I liked the most was ‘Brave’.